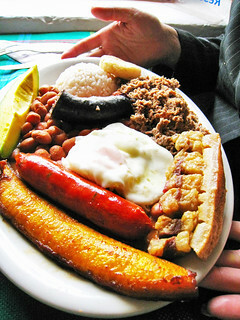 A typical Colombian dish. Almost every restaurant offers this (must be like fried rice and black bean beef in Chinese restaurants). This particular serve had frijoles (big juicy kidney beans), ground beef, chicharron (crackling fatty pork), fried egg, plantain, a chorizo sausage, morcilla (sausage stuffed with rice, pea and cow blood), avacado and rice.